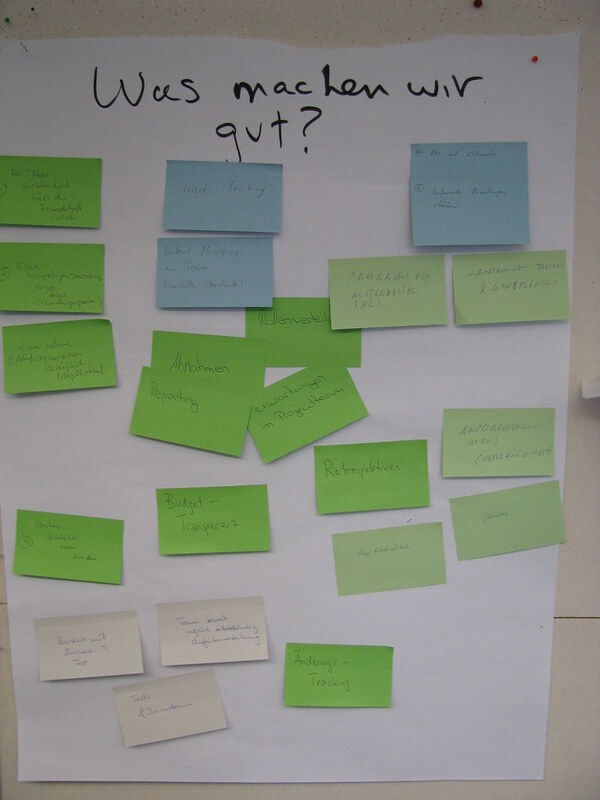 Last Week I held two open courses on Scrum: Agile Project Management with Scrum and Scrum Sprint Zero. Both took place here in beautiful downtown Zurich, Switzerland. The participants learned about Scrum but they also learned about the potential that a team can unleash under the right conditions. The ball point came was a fascinating example of how teams can self organize to improve themselves. 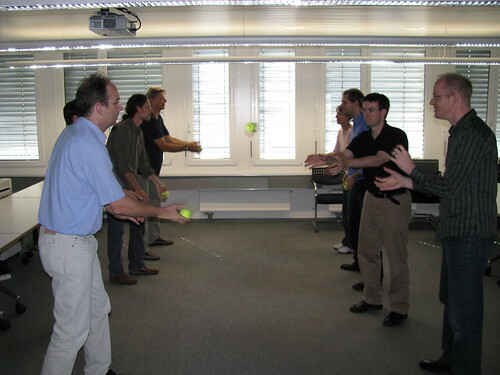 The team must produce something with tennis balls (let's just call them points for the moment). After getting an explanation how to produce points, the group estimates how many they can achieve. The first individual estimate was 8. The first group estimate as 24. They took bets on whether 24 could be exceeded. Their first run was 18. After 4 runs, they accomplished 67 and their best run was 75 - nearly 10 times the original estimate and 4 times the first run. How did they achieve this? Inspect and adapt, i.e. using the basics of Scrum. Those who stayed for the second course experienced "Zero and One," a simulated a project start up with Scrum. Sprint Zero: getting an initial product backlog and getting ready to start, and Sprint One - producing the first increment of functionality. During Sprint Zero, the group was trying to figure out how to work together: Who is the boss? What do we have to do?. By Sprint One, the group had come together as a team. They got into the grove and produced startling results. I just watched in amazement. The participants were very satisfied with the course. All participants felt they could recommend the course. 2/3rds or more gave the courses top note -- ":-)" -- for overall satisfaction. 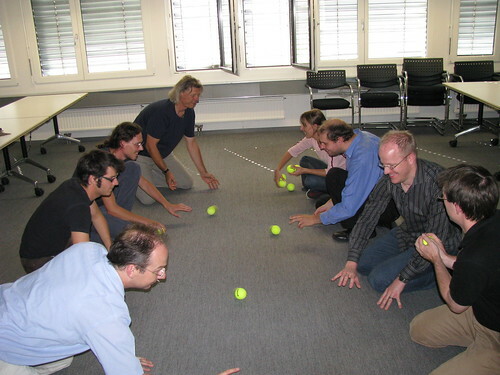 High points included the ball point game, the retrospective as introduction to the Scrum, the open discussion about real cases, and the practical exercises. The true teacher learns from his students. The next Agile Project Management with Scrum course will focus on the team learning to work together as a team and with Scrum. So "Zero and One" will be moved into that course. The advanced planning topics will be taught in a separate course, Agile Planning and Estimating. All courses will be held in Zürich, Switzerland (Schweiz) and in German. Prices and registration info will follow shortly. All the photos from the course can be found on flickr. The links that I promised the class will be posted later today as a comment. * Poll Results: How Long to Sprint? * Nokia Test - Is anybody really doing Scrum? I've heard positive things about the ball point game before... if you are looking for other great coaching games within agile, check this wiki out. I saw a session with these guys at Agile 2008 and was impressed with what they are starting to pull together. Use and contribute! Thanks. This reference is very useful. I like sound of the retrospective game and am looking forward to trying it out.